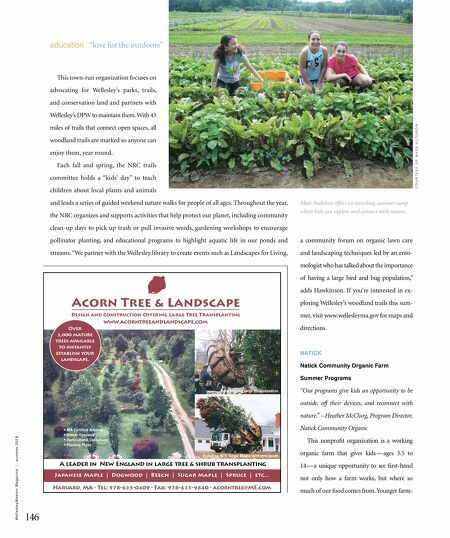 This town-run organization focuses on advocating for Wellesley's parks, trails, and conservation land and partners with Wellesley's DPW to maintain them. With 43 miles of trails that connect open spaces, all woodland trails are marked so anyone can enjoy them, year round. Each fall and spring, the NRC trails committee holds a "kids' day" to teach children about local plants and animals and leads a series of guided weekend nature walks for people of all ages. Throughout the year, the NRC organizes and supports activities that help protect our planet, including community clean-up days to pick up trash or pull invasive weeds, gardening workshops to encourage pollinator planting, and educational programs to highlight aquatic life in our ponds and streams. "We partner with the Wellesley library to create events such as Landscapes for Living, a community forum on organic lawn care and landscaping techniques led by an ento- mologist who has talked about the importance of having a large bird and bug population," adds Hawkinson. If you're interested in ex- ploring Wellesley's woodland trails this sum- mer, visit www.wellesleyma.gov for maps and directions. 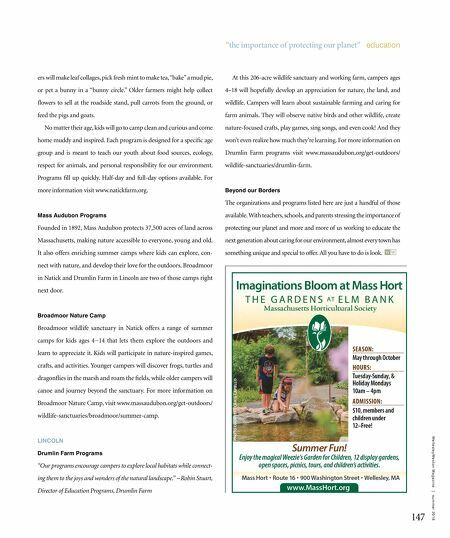 NATICK Natick Community Organic Farm Summer Programs "Our programs give kids an opportunity to be outside, off their devices, and reconnect with nature." – Heather McClurg, Program Director, Natick Community Organic This nonprofit organization is a working organic farm that gives kids — ages 3.5 to 14 — a unique opportunity to see first-hand not only how a farm works, but where so much of our food comes from. Younger farm- C O U R T E S Y O F M A S S A U D U B O N Mass Audubon offers an enriching summer camp where kids can explore and connect with nature. W e l l e s l e y W e s t o n M a g a z i n e | s u m m e r 2 0 1 8 146 education "love for the outdoors"